Indian skipper Virat Kohli on 4 June said that he "felt like a club batter" when Yuvraj Singh was in full flow during the ICC Champions Trophy match against Pakistan. Defending champions India has kicked-off its campaign with a thumping 124-run victory over arch-rival Pakistan. The Indian top order stood out in an all-round batting effort, propelling India to 319 for three after rain halted proceedings twice. Yuvraj smashed 53 off 32 balls and was declared as the 'Man of the Match'. "Yuvi took pressure off when I couldn't get runs. 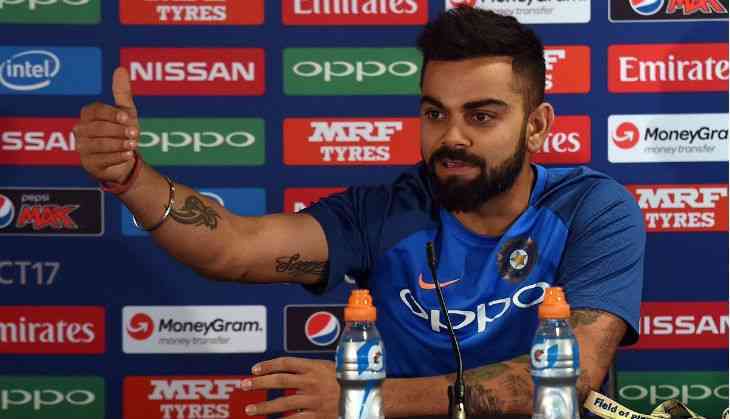 The way he was hitting the ball, I felt like a club batter in front of him," Kohli said at the post-match press conference. While India produced a resounding win, captain Kohli is not very pleased with India's fielding. "With the bat and ball, right up there - I would say nine out of 10. In the field we were still 6 today. Very strong performance, we've taken the confidence from the practice games. We need to tighten our fielding to compete hard against the best teams," the skipper said. The Indian inning was capped with a brilliant quick-fire from Hardik Pandya who hit 18 runs off 5 balls.